In only five weeks, a total of 39 deaths have been reported since May 20th 2011 after a deadly outbreak of E. coli occurred in Germany. Initially, a vast majority of the cases were reported in the northern states, spreading afterwards to the rest of Germany. Later on, some cases have been found in several European countries and also in the United States and Canada. Nearly all of these cases had a travel history to northern Germany. In total and according to the Robert Koch Institute (RKI) more than 3,200 people have fallen sick. Of those, more than 800 suffered of hemolytic-uremic syndrome (HUS) and about a hundred of them will need new kidneys or dialysis for life. German authorities initially pointed out the Spanish cucumbers as the source of the bacterium although later this statement was rectified due to the absence of the lethal E. coli in the cucumbers. Nevertheless, the banning of the cucumbers caused Spain a loss of 200 million Euros (about 300 million USD) per week. On June 10 2011, the RKI announced that contaminated raw sprouts from an organic farm in Germany are the likely source of the outbreak. Researchers are still deciphering the mysteries of this lethal bacterium and two recent scientific reports have been published so far (Frank et al., New England Journal of Medicine; and Bielaszewska et al, The Lancet Infectious Diseases, both very prestigious international journals). The Beijing Genomics Institute (BGI) in China, collaborating closely with the University Medical Center Hamburg-Eppendorf in Germany sequenced the bacterium genome. 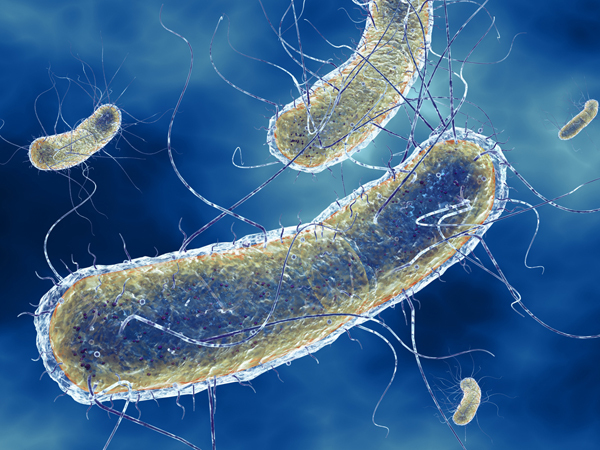 It was then discovered that this E. coli is closely related to one previously isolated in the Central African Republic known for causing serious diarrhea. But several differences make this bacterium even more dangerous. As reported by researchers, the E. coli responsible for the German outbreak (serotype O104:H4) is extremely resistant to antibiotics. Opposite to regular E. coli, this one binds with enhanced affinity to the host’s mucosa and produces large amounts of a toxin called Shiga-toxin, responsible for the bloody diarrhea and eventually kidney failure. Surprisingly, most of the affected individuals are adults (usually children under five are at higher risk of developing disease and dying from this type of infection) and almost 70% are women. In point of fact, this type of bacteria is difficult to identify due to its similarities with innocuous E. coli found in the intestinal flora. Escherichia coli (E. coli) is a bacterium commonly found in the gut of humans and other animals. Most strains of E. coli are completely harmless and even beneficial to their host since they produce vitamin K (which has a relevant role in blood coagulation among other biological processes) and prevent pathogenic bacteria from adhering to and colonizing the gut. On the contrary, some strains of E. coli identified as Enterohemorrhagic E. coli (EHEC) can cause severe food borne disease due to the production of toxins. It is transmitted to humans primarily through consumption of contaminated foods, such as raw vegetables, undercooked meat or raw milk. In an initial attempt to control the outbreak, and since most of the affected individuals reported to have eaten salad, the German authorities advised the population not to eat raw cucumbers, tomato or lettuce. 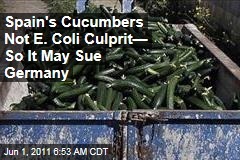 Initially an official announcement blamed the Spanish cucumbers as the source of the lethal E. coli. This statement was not well received by Spanish authorities since no case was reported in Spain and the E. coli outbreak was mainly localized in the north of Germany by that time. Soon the importation of vegetables from Spain was banned along Europe and many other areas, causing the loss of hundreds of millions. After the announcement of contaminated sprouts from an organic farm in Germany as the source of the outbreak and the statement by German authorities that the Spanish cucumbers were not responsible for the outbreak, the importations and exportations of produce in Europe are being reactivated. In fact, Spain is one of the most important producers of vegetables in Europe (if not the most) thanks to a warm climate, an efficient use of water together with the development of intelligent and optimized greenhouse technology. Therefore, as a very important supplier of fruits and vegetables, Spain has been one of the most economically injured countries after the outbreak that worsens an already hampered economy. In this regard, Spanish authorities did not initially rule out the possibility of undertaking legal actions against Germany for the economic losses but have finally announced they will not. Together with Spain, some other countries affected by the ban expect the European Union’s competent authorities to provide compensations, crucial nowadays with the global economic crisis. E. coli can be virtually detected in every vegetable without being a risk for human health. It is of note that none of the cucumbers from Spain showed the serotype O104:H4, the one isolated from the patients. On the other hand, the German farm that has been found to be the source of the contaminated sprouts has been closed and their products have been recalled while further investigations are going on. Fortunately over the past days the number of cases associated with this outbreak has markedly decreased and Germany has the situation under control. The consequences of this E. coli striking developing countries could be of catastrophic proportions. In this regard any information for a better understanding of why, when and where do these outbreaks strike will certainly be of benefit for all of us. In the meanwhile, vegetables from Spain are now slowly but relentless finally retaking Europe.